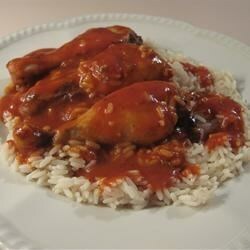 "Chicken wings are baked in a spicy (cloves, garlic, bay leaves, and cayenne) tomato-based sauce. The accompanying rice is flavored with turmeric, cloves, almonds, and golden raisins." Pour tomato sauce and soup into a large roasting pan. Stir in cloves, garlic, bay leaves, cayenne, and salt and pepper. Take the tip of each chicken wing and bend it back, securing it under the joint where thigh and drummette are joined. Place wings in pan, and spoon sauce over chicken. Cover pan, and bake in a preheated oven for 30 minutes. Reduce heat to 325 degrees F (165 degrees C), and bake until sauce is thick, about 1 1/2 hours. To prepare rice, combine rice, water, cloves, salt, turmeric, almonds, and raisins in a large saucepan over high heat. Bring to a boil. Reduce heat, and simmer until rice is cooked, about 10 minutes.